​This development comes as part of a larger wave in which investors are growing more and more aware and involved in the environmental, social and governance issues related to their investments. So far 34 stock exchanges provide guidance to companies listed in them so they can report on their impacts, and 12 more are underway to doing so. 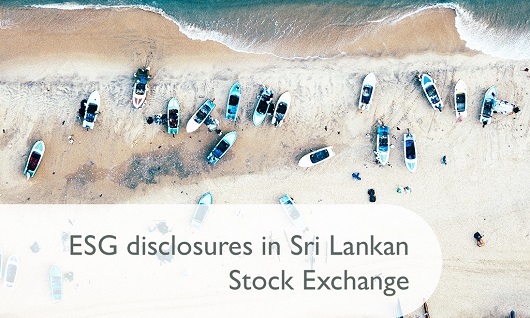 The Colombo Stock Exchange is one of the latest exchanges to address these issues and has partnered with GRI to best service its listed companies. As Aditi Haldar, GRI Director, South Asia pointed out, "This collaboration between GRI and the CSE is a partnership to strengthen integrity and robustness of the market that will contribute to thriving business and society. The leadership of CSE will be an example to many other capital market institutions". To kickstart the partnership, representatives from listed companies had the opportunity to participate in workshops to learn why and how organizations prepare sustainability reports. They also got more information on GRI, and how its standards can help companies and organizations better understand and manage their environmental and governance impacts. Staff at the Securities Commission of Sri Lanka and the Colombo Stock Exchange received a separate training to better understand the business case for Environment Social Governance reporting and what is the role of the stock exchange and market regulator to promote ESG disclosure amongst listed companies. And to ensure that these trainings are most effective, GRI will also facilitate regional peer-to-peer learning possibilities with other stock exchanges. This will give participants the opportunity to test and improve their knowledge, and to share it with others who face the same questions. In a related development, the CSE also recently launched a publication titled 'Communicating Sustainability: Six Recommendations for Listed Companies', to assist listed companies in addressing environmental, social and governance factors in their capital market communication. GRI will also provide input to the CSE on the development of a comprehensive ESG guidance document in-line with GRI Sustainability Reporting Standards. All in all, this is the very auspicious start of a strong partnership that will help report preparers throughout the region best understand and use the GRI Standards for their ESG disclosures. For more information on this partnership and on GRI's activities in the region, you can contact Rubina Sen.